Orchid Breeze Apt Villa Delfin vain $ 450 US / wk sesongin! Orchid Breeze Huoneisto Villa Delfin: Asu hämmästyttävä 1000ft2 yhden makuuhuoneen huoneisto (king size-vuode), kaksi erillistä vuodesohva olohuoneessa. Huoneistossa on graniitti työtasot, kauniisti kaakeloitu kylpyhuone ja lattiat, minuuttia rannalta, osa upea espanjalainen siirtomaa villa, joka on kätkeytyneenä ylös mäkeä viidakossa niin että sinulla on kaikki yksityisyyden haluat, ja sitten kun haluat päästä ravintola ja baari elämä, se on 5 minuutin ajomatkan päässä! Yksityisen merinäköala kannella, voit laittaa jalat ylös ja rentoutua suosikki juoman lähellä. Avainsanat: 1000 ft2 huoneisto täysin yksi makuuhuone king size-vuode sekä vuodesohva olohuoneessa nukkumaan 4. Ylimääräinen makuuhuone saatavilla king size-vuode. Valtava holvikatot, parveke mukava patio huonekalut ja merelle / viidakon näkemyksiä, Amazing allas näkymä viidakon ja meressä, olohuone, jossa mukavat sohvat ja ruokailutila. Täysin varusteltu keittiö. Lähellä rantaa. Solar varavirtaa. Kylpyhuone on suuri laatoitettu suihku. Orchid Breeze Apt is one of the upper floor apartments in Villa Delfin, and overlooks the jungle and faces the ocean. The entire villa is a delight from every angle, and not only is it architecturally beautiful and of quality workmanship, it has also been simply but stunningly landscaped. Huge colourful pots and garden plants, a touch of Honduran jungle art on the walls, and romantic outdoor night lighting made this place inviting and welcoming. The interior of this apartment has high wooden ceilings and quality light figures and trim around the walls, with complimentary designed tiled flooring. It is cool, and the enormous ceiling fans and through-breeze meant that the air conditioner was not needed. The kitchen was well stocked with pots, cutlery and crockery, and there was ample free drinking water supplied for guests. The villa has been designed to be unaffected by tropical rains and electrical blackouts, as solar panels are unobtrusively located on the roof, and all rainwater is collected. Wifi was strong most of the time in the living room, and some reviews say there is no parking....but there is paved parking for 3-4 cars. It is our opinion that the island cannot be appreciated without renting a car if one stays here, as it is a fair distance from the main beaches and restaurants, and the walk to the small local beach is down a VERY steep hill. Also, anyone who has knee problems or struggles with stairs, needs to request a downstairs unit, as Orchid Breeze Apt is reached by a couple of steep flights of stairs. We experienced a day of tropical rain and wind, but this villa offered the solid shelter that I chose it for, in favour of wooden structures on stilts that many of the homes on the beach are constructed with. Its a bit away from where you might want to have access to, but it is one of the most beautiful homes on the Island! This is a great property with some major flaws that keep it from getting more than 3 stars. First, what makes it great? Orchid Breeze is a very comfortable, large & breezy apartment. It is a concrete building that feels solid and keeps noise from the other apartments from ruining your vacation. It's location high on a hill provided a constant cooling breeze. There is a very large patio with a decent view of the ocean through the tree canopy down the hill. The bed is king sized & very comfortable. The kitchen is large and well equipped. A small pool for guests' use provides a great social space to meet fellow travelers. There is also a roof deck that provides enhanced views of the ocean (though there is not much in the way of furniture). The house has solar backup for power, so we were insulated from the power blackouts on the rest of the island. There is even a cell phone for guest use. Best of all, is Laurie, the property manager. She went out of her way to help us at every turn. The location of Orchid Breeze, well up a steep hill from the ocean (8 min walk, no parking) severely limits how guests can go about enjoying the water. The boutique hotel at the bottom of the hill is not friendly toward non-residents. To enjoy the beach guests must walk about 15 minutes down to often-overcrowded West Bay. That includes going up & down a set of stairs to cross a tall bridge, negotiating 150' of rock and past undeveloped property. (That latter fact is what made us a bit nervous coming back from West Bay after dark.) The hill is even steeper going from the house up to the road. Unless you're a mountain goat, you won't like it. As a result, everyone staying at Villa Delfin eventually rented cars. Taxis can be called from the provided list, but prices can be quite high. There is no TV & precious little internet access. There is a flat panel TV with a handful of DVDs to watch, but no access to any TV programs. Normally that's not a big deal, but sometimes it's nice to see what the weather is planning to do. The exceedingly poor quality of internet access is a much bigger problem. Orchid Breeze had literally the worst & slowest internet that I experienced anywhere on Roatan. All in all, this is a good value on an island that is generally over-priced. If you're planning to look for real estate & tour the island with a car, this is a good choice. If you are looking for a beach vacation, I'd keep looking. Thank you for your insightful review of our property and surrounding area. We are always striving to improve the things we can, like the internet (which can be tough at times as we are at the mercy of equipment, weather and service providers). While we can't change our location or our neighbours, we are currently upgrading our solar system and will soon be able to declare ourselves an "off the grid" eco friendly resort! Thank you again for staying at Villa Delfin! Beautiful turquoise water views and walking distance to West Bay Beach- perfect. The Villa was so beautiful that we often forgot that we were traveling in a developing nation. Clean, comfortable and peaceful- exactly what the Doctor ordered. In all my travels I’ve never met such gracious hosts, Carleen and Marlin, you are the treasure of the island. If we can’t book again with you- we’ll get as close as we can! Thank you so much for your review. We loved hosting you guys and we look forward to your return! My wife and I syated here for 2 amazing weeks. 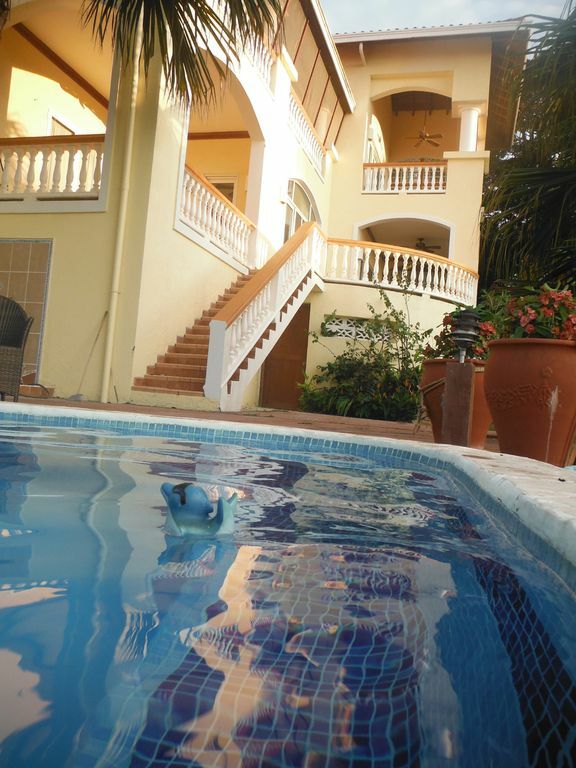 Roatan is a great place to vacation and this is a great lpace to stay. The Apartment was very clean. As a matter of fact is it practically new. Just built I believe. It has all the amenities that one would want or find in stylish american apartment: beautiful bathroom, great kitchen. Carleen and Marlin were very sweet and generous hosts. They picked us up and dropped us off at the airport. Even gave us some rides into town. It is an five minute walk to the beach. Though a little hill climb back tot he house. Town centers are a little distance. But taxis will bring you there and back if you like. You may want to rent a car. The Villa, . . . does it get any better than this? Nestled in the jungle, a luxurious 4 bedroom villa, overlooking the Caribbean with a private pool, ensuites in every bathroom, some bedrooms have both sunset and sunrise decks, the upper bedrooms have 20'+ ceilings, the rest 10', concrete construction, tiled floors, custom Honduran hardwood cabinetry. I LOVE this place. Saari Roatan on tunnettu sen upea sukellus. Se tarjoaa myös ratsastusta, snorklausta, kalastus ja jotkut valkoisimman ranta Karibialla. Siellä on paljon hyviä ravintoloita ja elävää musiikkia. Erittäin viihdyttävä saari mutta ilman kaikkia ennen kehitystä, että useimmat muut saaret ovat. Et näe yksi korkea nousu, iso ketju ravintolassa tai tallentaa. Et edes näe jarruvalo! Se on hyvin lumoava! We can coordinate airport pickup with a stop at the supermarket. It is a $35 US fee which you pay directly to the driver. The a/c in the bedroom at night is an additional fee of $10 Us/night, based on nightly usage only.